Welcome Bill Lapinski and Russell Maningas! Bill’s performance was very impressive: 13 total bingos, winning all three games, and the highest game points of 1116 out of 3 games. For his first Superscrabble Club game, he fitted right in and surprised everyone. Russell did very well for a first timer too, considering the last game he played was when he was 12 years old while growing up in the Philippines. Good sport, Russ! Again Rosy was here to cheer up all of us. Pat Reed had the high scoring bingo at 119 for SEEKING. The next meeting is scheduled for first Thursday, November 7, 2013. The website www.wordjudgeusa.com edits are done. You can visit the site now. Find out the word that inspired the inception of Superscrabble Club and the compilation of Word Judge USA. The Plant Kingdom Word List has been submitted to CreateSpace, a subsidiary of Amazon.com. Request for your free copy of PDF file for iPad, iPhone or desk top thru maliha@wordjudgeusa.com. I’m looking forward to it’s completion before end of 2013. The next meeting is on the third Thursday of October (10-17-13). 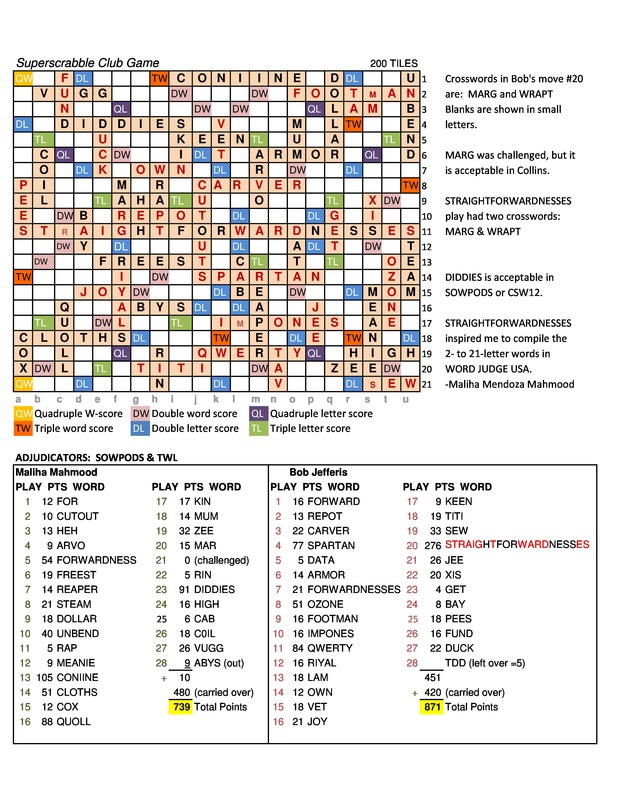 Please invite a friend to experience the Superscrabble Club games. Remember the goals of Superscrabble is to learn new words and to make a short word longer in multiple steps. It is a simple way of rejuvenating your brain cells. The following categories of words are good to know. To win $5 the word must have at least have 5 letters. FIRST ROUND: Something to do with wind musical instruments. Example: reeds, piccolo, flute, oboes, clarinet, bassoon, horns, hornpipe, saxophone, etc. SECOND ROUND: vegetables and herbs. Example: cabbage, carrot, pepper, spinach, tomato, broccoli, kales, arugula or arugula, endive, mints, garlic, onions, etc. THIRD ROUND: Words with -ite or ites ending. Example: malachite, bornite, ebonite, augite, bites, kites, mites, jadeite, ophite, oolite, albite, alunite, galenite, etc. APO, CRY, AL. NE, NESS, ES. Possibility: Start with CRY in the middle where Y should be on the pink square with a star, or where Y should be placed on the 11th square downward. Who knows? You might have on your rack 7 letters that can be hooked front and back like A-A-O-H-L-P-P. Hooking APO in front of CRY and PHAL at the end makes APOCRYPHAL a bingo play. Either you or your opponent might have NESS available to hook making it APOCRYPHALNESS; it is possible to have an ES (remember 10 S’s in the bag). Only one bingo possibility in this word; add ES making it APOCRYPHALNESSES. Whoever completes APOCRYPHALNESSES will win $150. However, if bingo is out of site early on, but you still have A-A-O-H–P-L (+whatever–an O or E), you can still play APOCRYPHA. Later you might have the L-N-E-S-S-E-S to hook at the end. If you try your best, nothing is impossible. APOCRYPHALNESS [noun]; APOCRYPHALNESSES, [plural] APOCRYPHALLY [adverb]; APOCRYPHA [noun] meaning: religious writing of uncertain origin.